Today I found out Albert Einstein did not fail at mathematics in school. 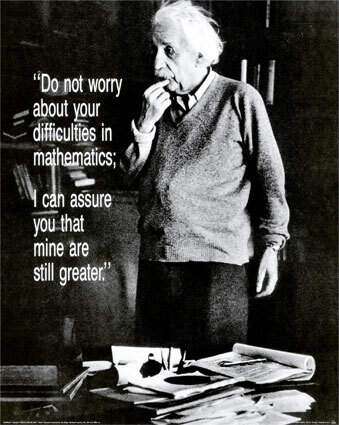 Indeed, by the age of 12, Einstein took it upon himself to see if he could learn geometry and algebra on his own. His parents subsequently bought him textbooks towards this end and, in one summer, he mastered both subjects, while coming up with his own proofs to prove the various mathematical theories he was studying, including his own way to prove the Pythagorean Theorem. Also at the age of 12, he began learning calculus, which, as noted, was about three years ahead of his classmates that would eventually qualify to pursue calculus. How the myth came about that Einstein was poor at mathematics at an early age isn’t entirely known. A few theories have been thrown about. One story, who knows if it is true, is that in 1896 (the last year he attended this particular school), the school he was attending reversed their grading scale so that “6” became the highest mark, instead of the lowest, and “1” became the lowest, instead of the highest. So it would have looked like he had suddenly gone from passing to failing in his final year, when comparing with his marks from previous years. Another potential origin story is that it was simply a case of him frequently needing to solicit the aid of mathematicians to double check is work, as well as to help him formalize his theoretical ideas into the language of mathematics. This, however, had nothing to do with being poor at mathematics; he simply wasn’t a mathematician and was often dealing with very advanced topics in mathematics that only mathematicians were generally proficient at. Even in these cases though, he typically picked up what he needed to know very quickly from the mathematicians who helped him. While Einstein excelled at mathematics, he was very poor at language, particularly early on in his life (this also carried on to a lesser degree later in his life as well, including being initially rejected at the Federal Polytechnic Academy due to poor marks in non-science related subjects). By his own account, he didn’t start speaking until he was four years old. This, however, may have significantly aided in him developing the habit of thinking in images, rather than words, similar to how many deaf people think. This habit of thinking in images is largely how he first thought up the idea of special and general relativity using “thought experiments”, called Gedankenexperiment. Indeed, his first idea that there was something wrong with Maxwell’s equations came when he was sixteen and performed a thought experiment imagining what would happen if you were traveling at the speed of light and observed light traveling alongside you. The light, from this perspective, would then seem stationary to you, but Maxwell’s equations didn’t allow for this. He subsequently wrote an essay on this, at sixteen, and began formulating a new theory based on this thought experiment, which eventually resulted in his paper on special relativity. When Einstein graduated from college, he failed to find work in academia as well as failed to be accepted into any doctoral program. Instead, he accepted a job as a third class patent clerk in a Swiss patent office. In his spare time, with the help of his wife, Mileva Mari, to double check his work (she was a physicist and slightly more advanced than he in mathematics), he wrote four papers that changed the landscape of Physics: proving that light acts as both particles and waves, not just waves; proving the existence of atoms and molecules; illustrating his theory of special relativity; and outlining the relationship between matter and energy. Einstein eventually got his wife to agree to divorce him by offering her the money he would receive when he eventually would win a Nobel Prize for one or more of his papers he wrote in 1905 (no lack of confidence there) :-). Apparently, she must have thought he had a good shot at it too someday, because, after thinking it over for a week, she accepted. She ended up having to wait until 1921, but eventually got the money. Another popular myth is that Einstein received a Nobel Prize for his theory of special relativity. In fact, he actually received it for “the discovery of the law of the photoelectric effect”. At the time, Einstein was immensely popular with the public and there was a big push for him to win a Nobel Prize for his work. However, there was quite a bit of controversy surrounding his work in special relativity, so the committee did not want to award him a Nobel Prize for that. Carl Wilhelm Oseen eventually suggested that they could award him a Nobel Prize for discovering a new law of Physics, thereby getting around the problem of special relativity potentially not being correct, while pleasing the masses that were pushing hard for him to win a Nobel Prize. Einstein never won another Nobel Prize, despite special and general relativity revolutionizing theoretical physics. Another myth surrounding Einstein is that he had an affair with Marilyn Monroe. In fact, he never even met her. Many proponents of this myth claim that Monroe suggested they have a baby together, making the perfect child, having her looks and his brain. He supposedly retorted, “But what if it has my looks and your brain?” This, of course, never happened and this anecdote is also commonly assigned to other actresses and intellectuals, including Isadora Duncan and George Bernard Shaw. Was Einstein a Slow Learner as a Child? Your dealings in logic are correct Kristopher… However, both you, Einstein, and Spinoza, are forgetting about an important concept illustrated in our bible about our differing perspective of the meaning “God”. Spinoza, saw our god as the interpretation of existence. Which in part is true. Einstein, saw god in the same way, but as the laws dictating existence. The error in both their interpretations is the idea that “God” must exist as the universe or in the universe. The way I see it, is that our creator both can, and cannot include his existence in the universe because the laws of our reality don’t demand or outlaw a being who created existence. This instead, implies that God would neither have to be anything nor nothing at the same time. For example, lets say you were born in nothing. Then you made something. Since you made it, it would have to be some sort of structure following your order of self relativity, if not, it simply would not be, because it wasn’t the way you want it to be. So therefore, yes; a universal order is most possible, and no; The creator does not have to live, be it, or live in it if not or so desired. So in basic terms, the way things are is because the author decided so. For he is reason. For, according to Greek mythology,(before anything, their was complete chaos)no order, or simply oblivion. So in conclusion, God is the universe because it is both the substance and order of existence derived from his being. But, I simply imply to all that…. He does not have to be if he so desires. You understand?